Reporting doesn't get much simpler than a traffic light. It’s possible to make decisions in your business based on just a single glance. In this mastermind extract, discover a system that will keep your business on track with minimal time and effort. 27:41 – What is the system? One-word business status reporting. [Click To Tweet]. Know where your business is at with a glance. [Click To Tweet]. I’ve got an interesting idea for you today. This will apply to you if you have a team or if you have a supplier who you deal with a lot to supply services. We’ll talk about the Traffic Light System. This is a reporting system that we use in our business, and each of my managers sends me an update in Slack, which is a software tool we talked about in a recent training. And I ask them each day to tell me one or two lines about what they’ve been up to and to just tell me green, orange or red. Literally one word is all I need to know. As the business owner, I can tell instantly if we are maxed out, or if we are all good. And also I can tell if we’re about to get maxed out, if we’re in that danger zone. Because as a service business, there’s a few things that people get tripped over with. One is, they have too heavy a cost. So they have too many staff, they don’t have enough customers, so they’re over capacity and they don’t make enough profit. The other one is just as bad, that’s when you don’t have enough capacity, you have plenty of customers but you can’t deliver, and your reputation suffers. So what we’re aiming for is the right amount of capacity, and that would be green. Green means that you have enough capacity, but you’ll also be wanting to make sure you make a profit at that, but you know you can deliver. When you’re orange, that’s OK, it means that you’re close to capacity, but you’re right there. As soon as you hit orange, you want to see, is it time to recruit? Is it time to hire? Is it time to find more supply? If you hit red, it’s almost too late. It means you’ve got to back off the marketing for a minute while you catch up with capacity, or you risk sinking your reputation. And this traffic light system is really good, and each of my managers does this. My content manager will do it for my SuperFastBusiness blog. If I give them 10 podcasts to edit, transcribe, illustrate and publish, I know I’m going to get a red light on the daily report, because I know they’ve got work backed up. If green, then I can just keep throwing podcasts at them, and I know that if I give them a podcast today, it’ll be published tomorrow. If it’s orange, I’ll likely expect it’ll be out in a couple of days. If it’s red, I wouldn’t expect to see it until next week. 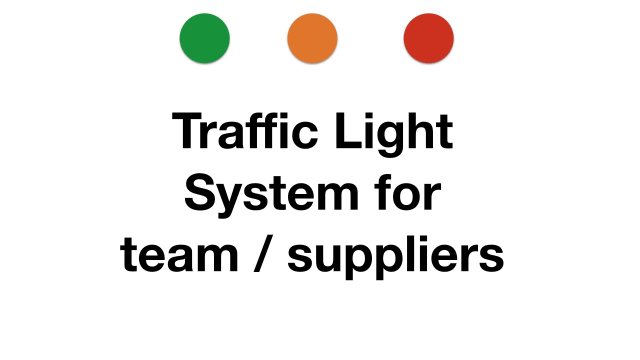 So the traffic light system for your own team or suppliers is a great barometer of where you’re at with the business. And this simple tool has helped my business stay in the right zone of profitability and capacity. At a moment’s glance, I’m able to know every day if the business is running smoothly, or if we’re having a danger zone. And one thing that I’ve noticed from helping people in the mastermind situation is that often they don’t realize they have a problem until it’s too late, and it’s a lot more difficult to fix a problem a long way down the track than if you catch it early. So that’s why I suggest that you build a traffic light system with your managers or your virtual assistant or your supply company if you’re doing a lot of work and you have a strong relationship, so if you can get a reporting system like this happening.